A campaign adviser caught lying to the FBI about Russian “dirt” on Hillary Clinton is now cooperating with investigators. 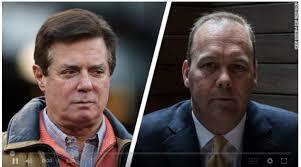 WASHINGTON ― Former Trump campaign chairman Paul Manafort and onetime business associate Rick Gates were indicted by a federal grand jury on charges of conspiracy and money laundering in connection with an intensifying investigation into Russian meddling in the 2016 presidential election. Manafort left his Virginia condo and, with his attorney, walked into the FBI field office in Washington early Monday. A 12-count federal grand jury indictment unsealed shortly after his surrender includes charges of conspiracy against the U.S., conspiracy to launder money, failure to file foreign bank reports and false statements. Manafort and Gates both pleaded not guilty to the charges in federal court. Separately, a former Trump campaign foreign policy adviser has pleaded guilty to lying to FBI agents about Russian “dirt” he was offered on Hillary Clinton, according to a plea deal prosecutors unsealed Monday. George Papadopoulos, 30, pleaded guilty on Oct. 5 and has been cooperating in the Russia probe. The charges are the first in the probe led by the office of special counsel Robert Mueller, a former FBI director. Monday’s arrests come three days after news broke that a federal grand jury in Washington had filed charges stemming from Mueller’s investigation. Manafort laundered more than $18 million, which he used to buy property, goods and services in the U.S., the indictment alleges. He’s accused of spending $849,215 at one clothing store, $520,440 at another clothing store, about $934,000 at an antique rug store, $62,750 for a Mercedes Benz, and $47,000 for a Range Rover. Reports have suggested federal investigators could use criminal charges as way to pressure those arrested into providing more information about alleged collusion between President Donald Trump’s campaign and the Kremlin to influence the election. The indictment charging Manafort and Gates makes no mention of Trump or the election. Paul Manafort hides behind his car visor as he leaves his home in Alexandria, Virginia, on Monday. Trump has aggressively denied allegations that his team colluded with Russia to win the election. A former prosecutor and FBI director, Mueller partnered with New York Attorney General Eric Schneiderman in August to look into Manafort’s possible financial crimes, including money laundering. Manafort ran Trump’s presidential campaign from June 2016 until his resignation in August of that year, after reports surfaced about his past lobbying work for pro-Russian Ukrainian oligarchs. He retroactively registered as a foreign agent and disclosed more than $17 million in payments for his firm’s consulting work in Ukraine, which occurred before he joined Trump’s campaign. Manafort met with Senate Intelligence Committee investigators in July to discuss a meeting between Trump associates and a Russian lawyer that was held during the election campaign to obtain dirt on Clinton. The next day, FBI agents seized documents and other items from Manafort’s house in Virginia without warning. Investigators have also issued subpoenas seeking testimony from a number of people linked to Manafort throughout the probe. Trump fired FBI director James Comey, who was leading the agency’s investigation into Russian interference in the election, in May. The following week, the Justice Department appointed Mueller as special counsel to oversee the federal inquiry into the Trump campaign’s alleged Russian ties. Next articleAre There Limits to Authenticity?